What Time of Year Do Samoyeds Blow Their Coats? That gorgeous fur coat drops in prodigious amounts every spring. 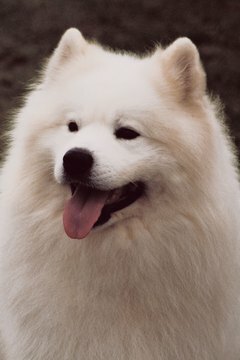 Your Samoyed is a beautiful dog who blows coat, or sheds her fur, in bagfuls. This is normal for this breed. Knowing what will happen can help you prepare for it. This cold-weather dog has to have a way of getting rid of the undercoat when warm weather comes. Your Sammy has a luxurious fur coat that can be pure white, cream, biscuit or white and biscuit. She’s a medium-size dog, with a body made for work. Her temperament is dignified and friendly, making her a good choice for a family. Because she’s a people dog, you shouldn’t keep her outdoors even though she can live outside to no physical detriment. She’ll thrive interacting with you and your family, so bring her in and allow her to take part in household activities. Being outside all day long won’t be a good thing for her because of her active mind. She’ll find ways of entertaining herself, like barking or digging up your favorite flowers. When it’s hot, she’ll dig what’s called a “wallow,” or a shallow area where she’ll reach cooler earth so she can lie in it. Oh, that beautiful fur coat. Maybe it's the reason you got her. While she's wearing it, it’s awesome. She has two coats, actually; one is the undercoat. The other coat consists of long guard hair that provides outer protection. She keeps this coat, shedding only her undercoat. When these dogs blow their coats -- that is, when they shed heavily -- at least once a year, they create a big mess inside your house. They shed minimally year-round. But that one time a year, their fur falls out in large amounts, meaning you’ll really have to keep up with the sweeping and vacuuming. To give you a ballpark idea of how much fur your Sammy will lose in one blowing season, try imagining several grocery sacks full of fur per week. How often your dog blows coat depends on it's "genital status." Spayed females and males, whether they're neutered or not, blow their coats once every year, right before it starts to warm up for the summer months. Unaltered females blow their coats two times per year -- another reason for spaying, unless you're intending to breed them to male Sammies. If you're not going to breed her, have her spayed to reduce her coat-blowing to once annually. Because of their thick fur coats, you’ll need to faithfully brush and comb your canine at least once per week. Use a slicker brush, a long-toothed metal comb with teeth about 1½ to 2 inches long, and a pin brush. All three of these are vital to keeping your Sammy’s coat in order. During fur-blowing times, help your Sammy by running a high-speed hair dryer on low heat or no heat over her coat to help work those dead hairs out. During fur-blowing time, comb her every day. If possible, do this outside so you don’t end up with "fur-fall” inside the house. Bathe her only once a year except in the case of contingencies. It isn’t necessary to clip or shave a Sammy. Her light fur color reflects the sunlight, providing protection from the sun’s rays and insulating her from the heat. In fact, shearing the dog will only harm her. Can a Cat Have Echinacea? Do Saint Bernards Like Hot Weather?